Blue Ridge Reservoir is just 9 miles from this cluster of 10 sites shaded by oaks and ponderosa pines. From the campground, hike the moderately difficult Arizona Trail to the recreation-packed reservoir. For solitude, skip the reservoir and hike a moderate 5 miles to trout-filled East Clear Creek (trailhead is about 6 miles from the campground). $8; no reservations; 928/477-2255. The pine-and-juniper campground is near the national monument’s visitor center. Drive 6 miles up the road to access hiking trails that cut through a forest of volcanic-ash rock spires and hoodoos. Come in September, when you’ll have the place to yourself. $12 (plus $5 entrance fee per person; no reservations), $3 per person at group site (plus entrance fee; reservations required); 520/824-3560 ext. 501 or 520/824-3560 ext. 501 (group reservations only). Shaded by cottonwoods, this campground is near Ancestral Puebloan petroglyphs and pueblo sites. Hire a private guide at the visitor center, a few steps away, to tour the park’s backcountry (you can’t access it without one). Free; no reservations; 928/674-5500. If you go into only one Mary Colter building at the South Rim, this is the one, thanks to its unique circular design, vintage Hopi murals, and some of the canyon’s finest views. About 24 miles east of Grand Canyon Village on State 64 at Desert View; . At 5,200 feet, the campground is just above the 55-acre, trout-stocked Lynx Lake. Try to get a campsite with a lake view. Pan for gold in Lynx Creek, ½ mile north of the recreation area. $18; no reservations; 928/443-8000. A 1959 Boles Aero trailer at the shady Dell. The Shady Dell’s nine refubished vintage trailers are set on a quaint property that feels more like a tail-gate party with croquet on the artificial-turf patio. This Tucson campground is the first KOA to install solar panel technology to power the grounds. New Southwest-style covered sites feature fireplaces and new two-bedroom deluxe cabins feature queen beds. The Prescott park is just minutes from downtown and adjacent to picturesque lake. Newly offered are Wi-Fi and 50-Amp sites throughout the upper loop of the park. Pitch your tent in this amid Aztec red sandstone formed by ancient dunes that date back to the dinosaurs. 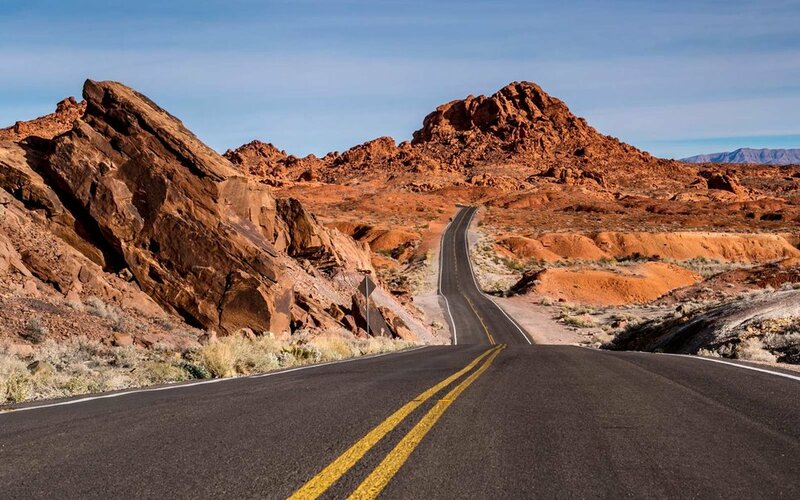 The campground’s namesake arch is one of the premier attractions, but you’ll also find petrified trees, narrow slot canyons and ancient petroglyphs, like the one at Valley of Fire’s second campground, which is better suited to RVs and trailers. One of only two campgrounds in the aptly named Valley of Fire, Arch Rock has an upper loop where sandstone rocks create more privacy. 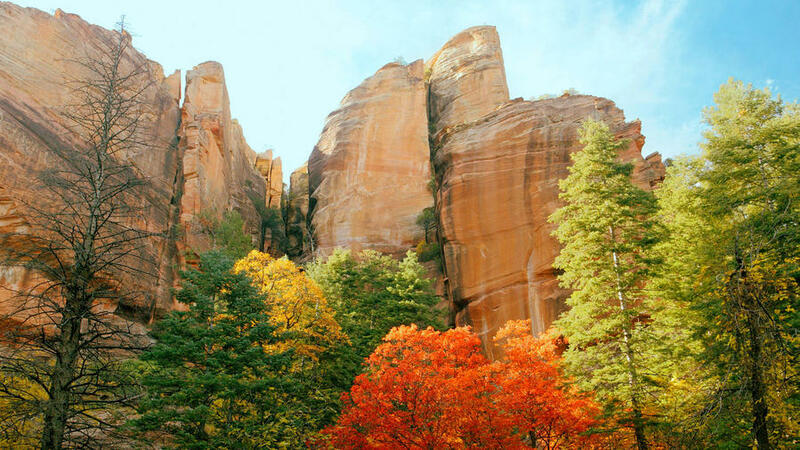 Hike the 4.5-mile Pinnacle Trail loop to a “forest” of red rock pinnacles. A flat, bed-size rock at campsite 18 makes for perfect stargazing. $14; no reservations; 702/397-2088. A desert photographer’s dream, the Cathedral Gorge State Park has a campground with 24 tent sites and newly installed electrical hookup for RVs. Park personnel have recently installed a steel-frame stairway down to Miller Point, which gives visitors a new view of the canyon a 1-mile trail below. You’ll find more than 100 palm-studded campsites just ½ mile from Lake Mead’s shores. Go in October―the water’s still warm and the days are still long enough to hike. $10 (plus $5 park entrance fee per vehicle); no reservations except for large groups; 702/293-8990. Two day-use picnic areas are located across from Lahontan Dam and Silver Springs Beach. The Lahontan State Recreation Area facilities include modern restrooms, showers, tables, and grills—and all facilities are newly ADA accessible. House-size volcanic ash boulders create a mini-city maze; ancient paths weave through the boulders. Campsites have little shade, so go in spring or fall. From $10; 575/536-2800; reservation line 877/664-7787. Tucked into a stand of juniper along the Rio Chama Wild and Scenic River, this campsite is in the heart of sandstone cliffs and Georgia O’Keeffe country. Snag the fourth site on the left―the only site with its own boat (non-motorized) put-in. Free; no reservations; 575/638-5526. Nestled in a ponderosa forest at 7,880 feet―next to the Jemez River―this site is a fly-fishing dream. From the campground, hike 0.25 miles to 40-foot Jemez Falls, then continue 2 miles to McCauley Warm Springs. $10; no reservations; 575/829-3535. Set on a mesa above Wild Rivers’ 760-foot gorge, the campground overlooks the confluence of the Rio Grande and the Red River. Hike down for a waterside picnic when it gets hot. $7 (plus $3 day-use fee); no reservations; 575/586-1150. The grass-and-pine meadow feels totally secluded at 8,800 feet, but it’s just 1 mile from Cloudcroft’s shop- and restaurant-dotted Burro Avenue. Hike or bike Trail 5661 for views across White Sands National Monument and out to Las Cruces. $13; no reservations; 575/682-2551. Set in Taos Ski Valley at 9,400 feet, the campground gives you access to New Mexico’s highest peak―13,161-foot Mt. Wheeler―and the easier 6-mile Long Canyon/Gold Hill loop. Invite friends and camp at the uppermost site, the largest of four. Free; no reservations; 575/586-0520. This high-country campground in Las Cruces overlooking White Sands National Monument and the Tularosa Basin has direct access to two national recreation trails. Aspens and pines shade the 14 campsites nestled 9,400 feet up at the edge of the Pecos Wilderness. Go in spring when the wildflowers are at their peak. $8; no reservations; 877/276-9404. Нашел в интернете авторитетный сайт , он рассказывает про красивые шторы на лоджию.